Here is a wonderful album of devotional music dedicated to Sai Baba, which enchant the listener with its simplicity and warmth. The songs — called Bhajans or Khirtans — are sung at spiritual places in India since time immemorial to immerse the aspirant in a devotional mood and to purify the atmosphere. The texts are Sanskrit mantras that describe various aspects of God and make these aspects living vibrations within and around us. 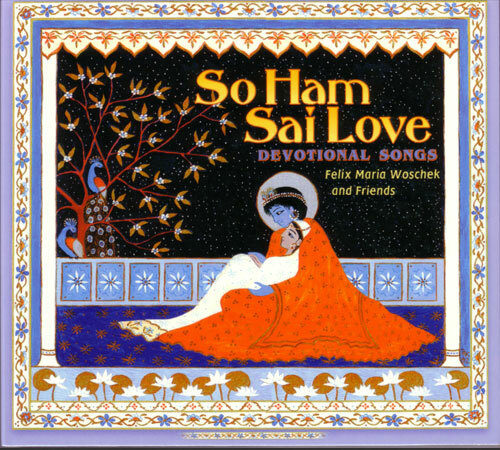 The most beautiful „Music of Devotion“ from Felix Maria’s first two productions, „Sai Love“ and „So Ham“, enchant the listener with their simplicity and warmth. In response to many requests, they have now been brought together in a slightly revised form on one CD. „Felix Maria Woschek’s beautiful, warm voice sings ancient, Vedic songs of faith in a way that brings them into a European spiritual landscape. (…) Ultimately it is quite unimportant which religion the singing celebrates. Who knows God needs no religion. The experience that really overcomes the listener is a deep, satisfying faith. The Indian mantras that Woschek sings become a „vehicle“ for everything that they „transport“: liberation, love, peace, grace, bliss. „The true significance“, as Woschek says, „cannot be appreciated by any translation, but only in the heart itself.“ Nevertheless, a sensitively worded explanation is provided to help the listener to understand each of the mantras. I was most particularly moved by the title piece, „So Ham“, the great mantra of one-ness so urgently recommended by Muktananda. Woschek sings it with an urgency that tells the listener: „Thou art this … Thou art the universe … Thou art God … In Thee are all things … „.